Furthermore! CNYO members will be performing a test run of the occultation event for those attending both our lecture at Liverpool Public Library this Thursday (March 6th) and our session of the International Sidewalk Astronomy Night this Saturday (March 8th, weather-pending). The official IOTA Press Release can be read on the CNYO site HERE. Our daytime skies are (often) filled by starlight from our blindingly bright Sun, while our nighttime skies are a very sparse but more complicated arrangement of the Moon, planets, artificial satellites, stars, and a precious few galaxies and nebulae that can be seen without anything more than the 1x7mm binoculars built into our heads. Occasionally, events happen “up there” that remind us that we live in a busier part of the Milky Way than the quiet regularity of our own Solar System lets on. All were treated to a nova in the constellation Delphinus last August, where a star otherwise invisible to the naked eye grew bright enough to see without optics, only to fade again weeks after. Comet ISON, heralded as a possible “comet of the century” almost a year before anyone had actual data, at least qualified for “comet of the year” as a dim fuzzball visible away from city lights in November (before fizzling out more dramatically in NASA images). The real winner of 2013 was unquestionably the meteor over Chelyabinsk, a 20 meter/14,000 ton near-Earth asteroid that surprised everyone (most especially the people of Chelyabinsk) last February 15th. The world benefited from the general mistrust of the police in Russia by its citizenry, as thousands of dashboard cams otherwise used to record traffic stops instead provided thousands of high-def videos and images of atmospheric entry. Technology has dramatically changed amateur astronomy in the past decade, with CCD cameras and commodity telescopes in the hands of trained amateurs providing images that would give many NASA images a good run for their money. Amateur astronomers are now at the vanguard of the space monitoring movement, discovering near-Earth objects, watching the evolution of impacts on Jupiter, identifying supernova in our own and nearby galaxies, even tracking satellites that governments don’t acknowledge existing. With all that in mind, CNY is going to have front row seats this coming March 20th as the Main Belt asteroid (163) Erigone slides briefly between ourselves and Regulus, the brightest star in the constellation Leo the Lion. This event, called an occultation, will dim or completely block the light coming from Regulus for up to 14 seconds, simultaneously giving scientists a chance to learn more about Erigone. If you’re an amateur astronomer, citizen scientist, or just someone willing to look to your South at 2 a.m. once this year, fellow observers in CNY extend an invitation to you to report your findings to an organization that will use everyone’s data to determine the shape of Erigone. The path of Erigone’s shadow on CNY. Highest confidence of observing the occultation is between the blue lines, some additional confidence of observing it between the blue and red lines. The International Occultation Timing Association (IOTA) has been planning for the Regulus occultation for many months, from mapping out the best places to observe the occultation to corralling amateur astronomers to help in the data collection. On the morning of March 20th (in the 2:00 to 2:10 a.m. EDT range), observers along a very thin stretch of our planet will point their scopes, cameras, and eyes to the sky to see the star Regulus either dim or go out completely for several seconds, only to reappear unscathed. Those few seconds mean everything to members of the IOTA planning to calculate the shape and size of Erigone, and they will not complain if more observers provide more data. 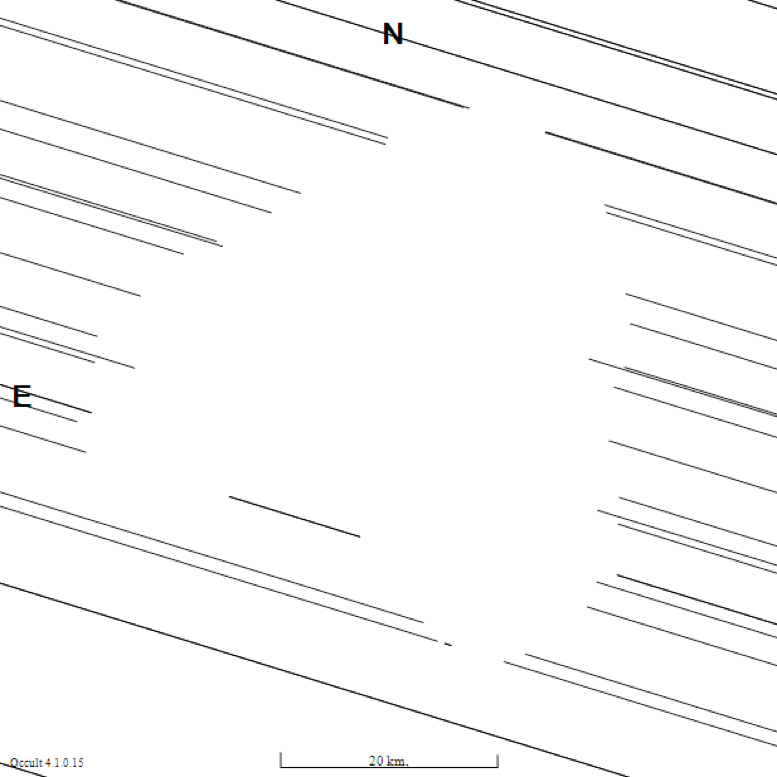 And just how will this timing data be used to estimate the shape of the distant asteroid Erigone? Consider the old Indian story of the blind men and the elephant. 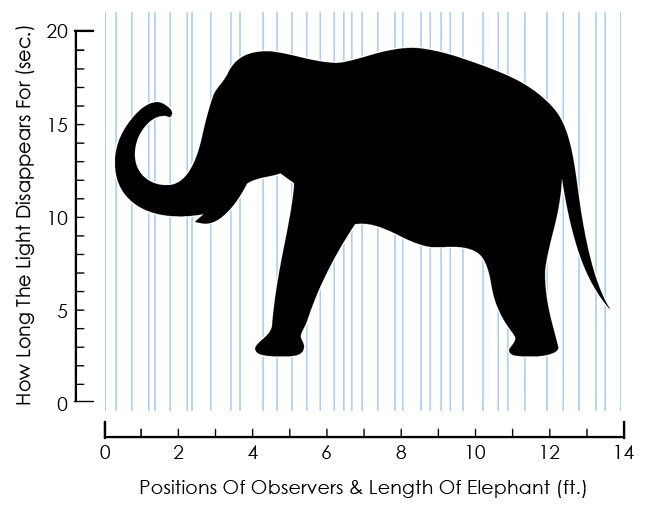 The elephant, being much larger than the stationary men, is believed to be very different things depending on where the measurement is taking place. One old man thinks the trunk is a snake, while another thinks that the leg is a pillar, while yet a third thinks that the tail is a rope. Instead of a large, stationary animal, Erigone will be a swiftly moving rock that will cast a Regulus-powered shadow on the Earth, and CNY in particular. If Erigone were that elephant, observers at the trunk edge of the shadow would see Regulus disappear for only a second, those at the tail edge for less than a second, those at the center line of the belly for 10 seconds, and those lined up with the legs for 15 or so seconds. 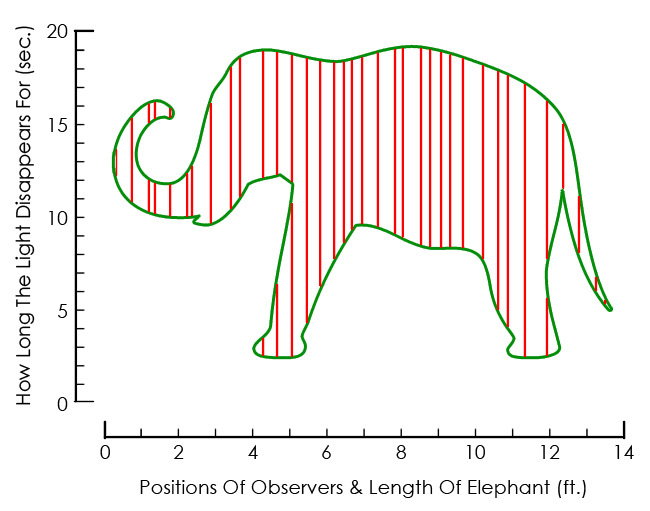 Consider the series of images below, showing the elephant’s shadow overlaid on blue lines that represent an observer seeing light from Regulus (Figure 1), red lines marking when those observers didn’t see the light from Regulus (Figure 2, and note that observers on the trunk side would have seen Regulus blink twice! 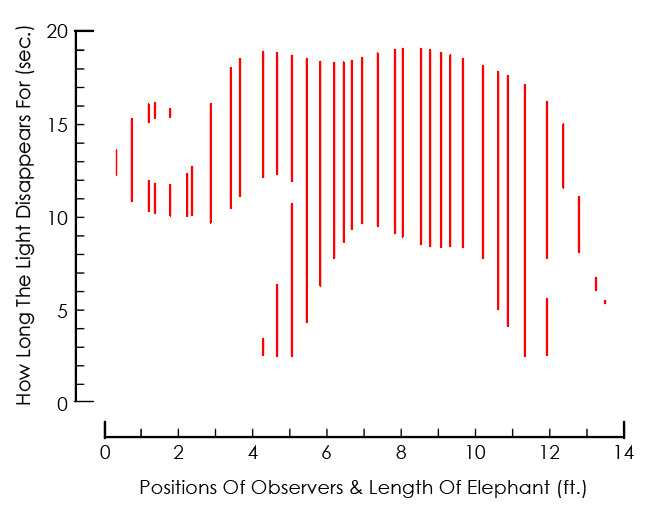 ), and finally the estimated shape of the elephant (in green) as taken from everyone’s submitted data (Figure 3). Figure 1. The hypothetical elephant’s outline over the light (blue) of Regulus. Figure 2. The locations and timings of when the light from Regulus was NOT observed (red). Figure 3. The outline of the hypothetical elephant (green) as estimated from the occultation measurements (red). You see? It works! Taking the disappearance times and the locations of the reports, IOTA members can put together a complete disappearance map of the asteroid like that shown below for asteroid (234) Barbara. In the case of Erigone, the shadow it casts will almost certainly be visible from Utica (east edge) to Auburn (west edge) and might be observable from Little Falls to Seneca Falls. This approach to determining the asteroid’s shape means that people who DON’T see Regulus disappear are just as important as people who DO see it disappear, as the “DON’T”ers help narrow the maximum estimated width of the asteroid. All measurements are important measurements! The shape of asteroid (234) Barbara from occultation data. The Solar System is a kind of shooting gallery of small and not-so-small objects, a fact we can only rarely appreciate given the distances involved. As technology improves and more people keep eyes on the sky, we may find more direct evidence of just how busy things are just in our own Solar System. Meantime, CNY observers can appreciate that we’re finally the best place to be to both study and enjoy an astronomical rarity (weather-permitting, of course). But wait! There’s more! Only in the past few weeks have IOTA members stepped up their game, proposing to expand the range of observers here on the ground to look for evidence of a moon (or more) around Erigone. The process is the same, measuring any dips in the brightness of Regulus as Erigone approaches to occult. The difference here is that the dimming by a body orbiting Erigone may dip the brightness only slightly before or after Erigone does depending on its size. If the object is too small to obstruct our view of Regulus completely, it will drop Regulus’ brightness by what might be a pebble’s worth placed on top of your smartphone screen compared to Erigone’s cement block’s worth. If the object is large enough, it may occult Regulus completely as well, making the data processing all the more complicated. As you might expect, measuring that small change in brightness is not a task for lousy equipment, but is within the realm of possibility of local observers with good quality CCD cameras on their scopes. If any caught moon is significant in size, it will be easy for all to see and time. 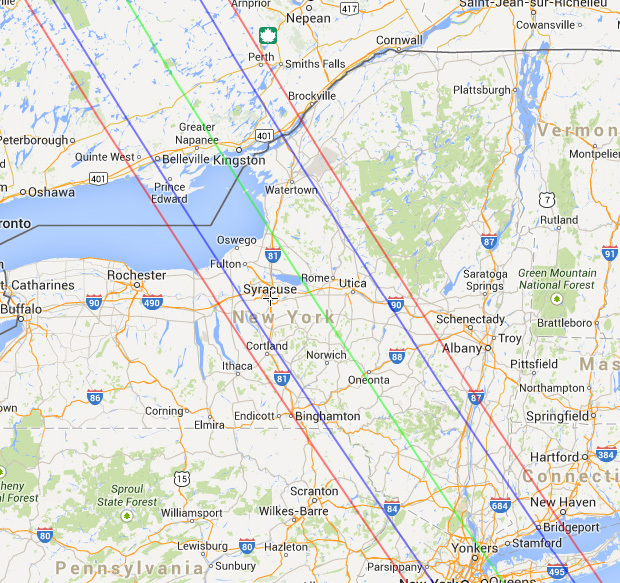 Provided the sky is clear, anyone in CNY should be able to see the occultation with or without binoculars. Those interested in reporting their timing and dimming data are encouraged to check out the occultations.org/Regulus2014 website for all there is to know about the event, then the www.occultwatcher.net/regulus-erigone/ website to see what data the IOTA is looking for. To be kept in the orbital loop about the occultation and any observing plans around CNY, you can contact members of CNY Observers (www.cnyo.org) or check in with any of the other local astronomy clubs in CNY, all of whom have members planning on observing (and, hopefully, recording) the occultation.